The Cuba Concert Trio, Concertante, won the Golden Award for interpretation in the recently finished Festival of Friendship Spring of April held in Pyongyang, capital of Democratic Korea. 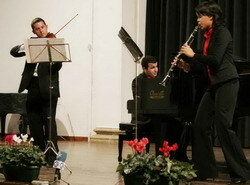 The trio is integrated by Fernando Gell, piano, Dianelys Castillo, clarinet, and the violinist Fernando Muñoz. The group received from their first appearance a warm reception by the public and the recognition by their colleagues from other nations. The digital site of the Cuban Foreign Ministry indicates that the Cubans competed together with artists from another 20 countries and from the Korean community abroad. The competition, in its 26 edition, covered dance, music, choral expression and circus art.